You are here: Home » Gang of Eight makes it easier for Asylum Seekers, like Boston Marathon Suspects, to come to U.S.
We go now to page 551 of the Gang of Eight’s “Border Security, Economic Opportunity, and Immigration Modernization Act,” Subtitle D-Asylum and Refugee Provisions, Sec. 3401. Time Limits and Efficient Adjudication of Genuine Asylum Claims. 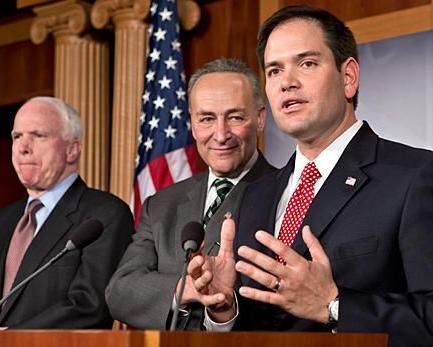 First, here we see how the Gang of Eight has amended the existing asylum laws, 8 U.S.C. § 1158, by giving more power to the Secretary of State, in this case to Janet Napolitano. Next the asylum seeker gets to add to their claim if circumstances “materially” change. What that means exactly is anybody’s guess. Would some horrific notes and letters from friends be considered material? Can the asylum seeker change their original story? Who knows. To get a sense of how arbitrary the existing asylum law 8 U.S.C. § 1158 already is, see “B: Burden of Proof, (iii) Credibility determination.” This contributes to the Vegas-like operations at the United States Citizenship and Immigration Services (USCIS) which is how dubious people may be legalized. Next, we learn that the Gang of Eight wants to give people, who were previously denied, another chance. Discretion (which arguably goes to credibility) has been taken off the table. Additionally, the 1-year time frame to file has been arbitrarily extended to 2-years. What the asylum seeker is doing in the meantime is anybody’s guess. We do know is that in the case of President Barack Obama’s aunt Zeituni Onyango, an asylum seeker, she lived off public housing in Boston for years after defying a deportation order. Meanwhile Sens. John McCain (R-Ariz), Lindsey Graham (R-SC) and Chuck Schumer (D-NY) of the Gang of Eight continue to insist that their immigration reform bill, must be passed because, “Immigration reform will strengthen our nation’s security by helping us identify exactly who has entered our country and who has left – a basic function of government that our broken immigration system is incapable of accomplishing today.” They continued that posture during a Congressional comprehensive immigration reform hearing held on Monday. Let’s keep it real. The immigration system broke under both Republican and Democrat leadership (Bush, Clinton, Bush, and now Obama). Washington created this crisis. The reason why nobody knows who is in America is because of lawmakers like the Gang of Eight failed at their primary duty to protect America’s citizens. If these politicians had any self-respect, particularly the long serving ones like Sens. Schumer and McCain, they would have resigned and apologized to Americans for failing to do their jobs. Sen. Schumer’s role is especially disgraceful, considering he was responsible for pushing President Ronald Reagan’s amnesty through in 1986 that promised to fix America’s immigration at that time. Since then the crisis has exploded. That’s 27 long years of failed leadership that has hurt America’s national security and economy to his credit. Why is he still in office? Seriously? As documented in Crime & Incompetence: Guide to America’s Immigration Crisis, terrorists typically use student visas ( often don’t attend the school), asylum, and phony marriages to “legally” come to America. They have been doing this for years—decades. Does he really think terrorists are going to come out the “shadows” because of his bill? The Gang of Eight’s disconnect with reality, coupled with a dangerous naiveté may explain why the senators decided to make granting asylum easier while making the immigration crisis worse by dumping millions of illegal aliens, including gang members and drunk drivers into a broken, incompetent, crime riddled system.